I saw him as I walked into the drug store. He was a tall man, covered in sweat, hunched over his cart. Probably in his 60s, with an unkempt beard. Dressed in ratty shorts and a tank. I immediately thought a number of things. He probably was doing yard work to get that sweaty. But why run to the drug store like that? He looks like a racist/white nationalist. I live in a very sophisticated area of the country. Just outside of Washington, DC...in what we would call the "close-in" suburbs. I live in a working class neighborhood tucked between the rich people and the poor people. So while it's an area where you can't buy a lean-to shack for less than $400K, it's nonetheless diverse. And, not for nothing, DC or not, I live in Virginia. Which was a Confederate state. And there are a lot of people round these parts that are proud of that history. So at a glance, I thought I had this guy figured out. As I stood in line behind him, candy in hand, another register opened up. So I got his attention and let him know he was first in line for the new register. That's when he said to me, "no, you go first. I'm not in a hurry." So I went first. My total was $4.10, and I was paying with a $5. He gave the clerk 10 cents so I wouldn't have to manage all that change. Turns out, I was the one who harshly judged. Turns out I was wrong. I was the hater. This man was a kind man. As I walked out, I saw him kidding with the ethnic checker. He was apparently a regular. I kinda felt like crap. I saw what I was becoming in this difficult time in America. I have been having a really hard time with all of this stuff going on. I can't even express how repulsed I am by white nationalists. I'm just as repulsed by our president. I was shocked at the pictures of clean cut young men with baseball bats and sticks attacking people. Racists are not just old men. It's a cancer in our culture that never seems to go away. But I am struggling with the monuments and history that seem inextricably intertwined with racism. See, in a country as large as the US, one state was host to 60% of the battles of the Civil War—Virginia. My state is rich in so much history. George Washington literally slept a couple of miles from my house (I live on land he once owned.) The homes of signers of the Declaration of Independence and framers of the Bill of Rights are all over the place. And so are Civil War battlefields—all of which are in Confederate territory and most of which hosted wins for the Confederacy. Tourism at those battlefields is big in this state. Those battlefields are sacred ground. Stonewall Jackson got his nickname at Manassas Battlefield—a battlefield named by the South (the North called it Bull Run. The South named their battles after nearby towns and the North named them after nearby landmarks and waterways. So the Battle of Manassas and the Battle of Bull Run are the same battle. The Battle of Antietam is also known as the Battle of Sharpsburg. Most of the battles have two names. And some of the battlefields still bear the Southern names, presumably because the South won there.) Behind Mount Vernon and the big Air and Space Museum, Manassas Battlefield is one of the biggest tourist attractions in Northern VA. In fact, the first Battle of Manassas/Bull Run (there were two major battles fought there, a year apart) was one of the key battles in the war. The Confederates won that one. In fact, they won a lot of battles in Virginia and the South. It wasn't until they were able to press north into Maryland and Pennsylvania that the North gained a foothold and was able to eventually defeat the South. See, nobody expected the South to last two days in the war. In fact, the elite from DC packed picnic lunches and rode out to Manassas in their finery to sit upon a hill and watch the Federal Army make short work of the Rebels. That was the assumption...the war would be over as quickly as it started. But that's not what happened. General Jackson stood "like a stone wall" against the onslaught from the North and he pulled out a win. The war wouldn't end for another four years. And those tourists who came to see the battle? They ran, screaming for their lives, in the chaos that ensued as the North retreated. I'm not going to make any excuses for the impetus behind the Confederates. They wanted to keep their slaves and were willing to secede from the US and then attack us for that right. But there is a part of the Civil War story in the south that nobody ever articulates. It's that part that had the fortitude and savvy to hold their own against a more qualified army for four years. NOBODY expected them to last that long. And it wiped out a large percentage of the male population in the region. But they didn't give up. When a southerner celebrates Lee and Jackson and their Civil War history, sure, some of them are celebrating racism. But most of them are celebrating the never-give-up spirit of the south. I get that it's hard for most people to separate. It's hard for me to even articulate. But it's not all about racism. A lot of it is about pride in standing up to a force greater than them and holding their own. The spirit is very American. The racism, however, is not something we condone. Please understand, I'm not defending the part about racism. 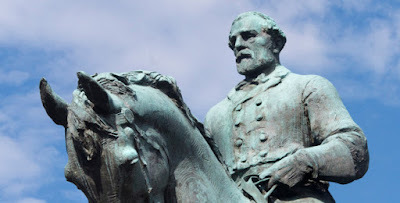 I'm defending the parts of those southerners that weren't about racism...the courage, the sacrifice and, hey, I'll bet even Ulysses S. Grant would agree, Lee was a genius as a leader. Southerners who celebrate the war aren't necessarily celebrating racism. They're celebrating the spirit and moxie of the South. So, put that aside for now. I get that many of these statues were erected to intimidate black people. I know there are plenty of racists no matter where you go in the country. For example, there is absolutely no logical reason for a Confederate statue to be in Baltimore. None. The Confederates didn't win a single battle north of DC. They were not welcome there at any time. Ever. And before I say the next thing, I'm going to state this: If it makes African Americans feel uncomfortable, I defer to their needs, because theirs are more important than mine in regard to this. But I struggle with whether or not the statues should go. And I'm not alone. By a slim margin, even blacks in this country agree they should stay (44% keep vs. 40% remove). If you split it out by Dems and Republicans, Dems want them gone by a slim margin (44% keep vs 47% remove.) But Americans, in general, agree they should stay. I can't find the Washington Post article I'm quoting, but I found an email I sent to a friend with the numbers in it. I used to vacation at an old plantation in the Virginia countryside. The same family had lived in the house for 300 years. And during the war, one of them was a Confederate Colonel. There were black ladies who made the breakfast in the morning and kept the rooms clean at the B&B. Those ladies were descendants of the slaves that worked in that house. They could work anywhere...plenty of B&Bs in the countryside. But they chose this place because they considered it THEIR home. They were raised and lived on the land given to them after the war for reparations, just down the dirt road. They undoubtedly shared the same bloodlines. They loved the family that once kept their ancestors as slaves and the family loved them back. Was it difficult and complicated? Yep. Was it anything but respectful? No. This blew my mind. You won't find this many places—where both families have that same longevity in a single location. It was a very interesting social study. One of the ladies was so old (80s-90s) that they were keeping her in money in her old age. The family suggested giving generous tips to her. The females in her family knew little other than working in that kitchen. She talks about being raised on that kitchen floor as a toddler. I will probably never understand it. It is an incredibly complicated dynamic that most of us will never understand. It doesn't apply to the larger population of whites and blacks. But it is an interesting study in a part of the VA countryside that hasn't changed much in 150 years. What this is all getting at is that I am 100% against racism. But as a Virginian (and someone who writes about the Civil War professionally on a regular basis), I might see the Civil War a little differently than many people. And I get why reenactors reenact. And I get why a person can look at those statues and not see racism. And I get why the south is proud of their heritage and doesn't consider their pride racism. There is a whole other thing that they identify with regarding the war. One more Civil War story. When Lincoln was assembling his army, he approached Robert. E. Lee to lead it. Lee was an American hero at the time and, truly the best we had. Yes, he had slaves, as did many in the north and south at the time. It was commonplace. The "Lee" name is huge in Virginia. They came here in 1639—more than 200 years before the Civil War. They were a founding family of Virginia and of this country. They fought in the Revolution. They are inextricably intertwined with Virginia and United States history. Lee was on board to lead the Union...until Virginia seceded. Then he had to choose between his country and the state that his family basically founded. His decision had NOTHING to do with slavery. At the time, he lived high upon a hill overlooking DC. He called his estate Arlington. When he chose to fight for his state, his land was immediately claimed by the Union...a valuable spot for defending the Federal capital (and, in fact, there is a narrow swath of Virginia that was never part of the Confederacy as it was immediately taken by the north to protect the capital. My house is maybe a half mile into the Confederacy. To say being a Virginian was complicated on the line between North and South is an understatement.) The animus at that point against Lee was such that Lincoln's administration turned Lee's magnificent estate into a cemetery so he'd never want to return. To this day, Arlington National Cemetery is where our nation's heroes (including my father and mother) are buried. For the most part, the Civil War was about slavery. The South didn't like the country telling them they couldn't have slaves, so under threat of not having that "freedom", they rebelled. It was about slavery. And it was about principle. And it was, ironically, about their freedom. And they lost. But the closer you look at the dynamics in place, there was so much more going on beneath the surface. The rebels didn't wake up in their tents every morning saying "I'm gonna go kill me some Yankees so I can all have the slaves I want." They were fighting for their rights and for their ill-conceived honor. And while the atrocities of slavery are well documented, there is a piece of that story that we will never understand...the piece that keeps those ladies serving the same family 150 years later. So, for me, those statues don't represent slavery. Lee and Jackson might have been on the wrong side of history, but they can't be dismissed as just traitors. Their genius, unfortunately, is why the war lasted four years. They were brilliant tacticians, both of whom had loyally fought for our nation before. They were fighting for what they thought were their freedoms. And yes, that was all effed up. But they are not one-dimensional men who are so easy to brush off. We've turned this whole statue thing into being just about race. But in the south, it's about way more. It's about our history and heritage (you literally can't go anywhere in VA and be more than 10 miles from a battleground...no other state was as ravaged as ours and no other state had as many "brothers fighting brothers"), the strength of our people, and the spirit of our region. Completely aside from race, there is a lot that the south connects to in that history. To borrow a cliche, this matter isn't so black and white. What I support is for communities to decide what they feel comfortable with. Charlottesville decided as a community to remove their statue. I commend them. If Richmond, the capital of the Confederacy, were to remove theirs, I'd be sad. Nowhere else are those statues more appropriate to the history of the town. But if they choose to remove them, that is their thing. It's important to know that the South—the Confederate States of America—went to war with the USA. It's also important to know that we reunited. The men who fought for the south didn't hate their country. They hated laws they felt restricted, ironically, their freedoms. At the time, our country wasn't even 100 years old. We were still working out who we were and wanted to be. It is one of the many shameful times in our history. The ancestors of men on both sides of the Civil War slaughtered the American Indians to steal their land and murdered their own countrymen in the Revolutionary War. There is no purity lost on our forefathers, nor on our path to becoming the US. While I disagree with the false equivalency Trump drew, Washington was as much a traitor to his country (England) as Lee was to ours. The only difference is that Washington won. Which made it OK. Because now we exist as an independent nation. But make no mistake, we are nonetheless a nation founded by questionable morals, unmistakable greed, and senseless violence. If you are going to love this country, love it with eyes wide open. We may stand for some honorable things. But we did not get here in honorable ways. Having a lack of regard for those not like us and turning traitor on our own countrymen are, unfortunately, written into the American DNA. All of that happened before the Civil War. There is no South or North and no racist or angel about it. We wouldn't be here today if we weren't EXTREME assholes. Moving on, the Memorial Bridge in DC spans the Potomac between Arlington National Cemetery (Lee's home) and the Lincoln Memorial. No mere coincidence, it was built there specifically to bridge our history...to represent the peaceful reunification of Americans after war tore us apart. That's the real headline about the Civil War, one that rarely gets mentioned amidst all the stuff about race. The South accepted their lot and moved forward as Americans. And yes, some of them spawned generations of haters. Their forefathers probably fought out of hate. But not everybody did. Hate can only last you so long when the earth is littered with the decaying bodies of people you considered friends. We have never lost as many men in our history as a country as we did in the Civil War. One one day alone at Antietam Battlefield, between dawn and dusk, 22,000 men ended up dead, injured or missing. One day in a war that lasted four years. The war might have been about slavery, but it held much more meaning for the men fighting it. It had to have. These guys wore uniforms made from wool and fought both battles of Manassas in the sweltering heat of a VA summer (the South winning both battles.) They went without food while marching great distances. Nearly 2/3 died of hunger and disease, not of injury. These guys may have had some wrong-minded ideals, but they put down their lives for those ideals and lost everything in the process and then came back home to the US and paid their dues responsibly, most giving land to their now free slaves as laws dictated. I struggle with the statue thing. I can't see the Civil War in simplistic straightforward terms. My heart aches that white nationalists exist and I will never defend them. What we continue to do to blacks in this country is wrong. Do not misunderstand me. But I can't hate Robert E Lee and Stonewall Jackson. I can't condone the removal or denigration of statues of them WHERE APPROPRIATE. And I can't put them in the same bucket as Nazis, though both groups had racist agendas. Unfortunately, my state is so riddled with tributes to these men that it's ridiculous. There are far more roads and schools and statues to these men than there are to Grant or Sherman, who were their equals in the Union. And that is just wrong. But I live in the south. And there is far more to this period of history here than meets the eye. So going back to the start of this post, I think it's important we don't judge too quickly. And that we don't judge without proper understanding...without seeing these men who fought in that war as three-dimensional people who were propelled by thoughts other than racism in many cases. After all, seeing others as less than 3-dimensional humans is how hate takes hold. And we need to watch that, while we're hating the haters, we don't we don't turn into haters ourselves. Just because one side is wrong, it doesn't make us automatically right, regardless of how we approach it. Hate vs. hate will not heal this country. Yes, we should resist and protest. But we should also understand and not be so quick to judge. Some of the people you want to hate are haters. And some that we label as racists, frankly, just can't articulate what they stand for in regard to that war and those statues. Our job in all of this is to not lose our integrity as we rail against what's lacking in theirs. We don't have to like or approve of what people believe or feel. But if we are Americans and believe our country's founding ideals, we have to honor their right to things we wouldn't choose for ourselves.